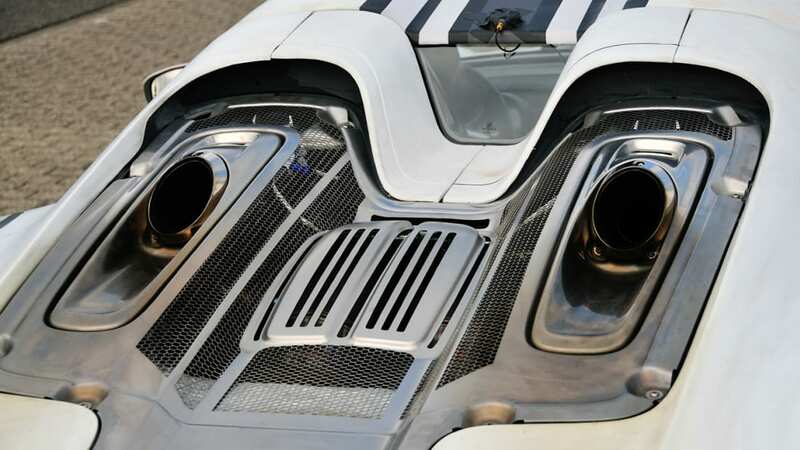 The Porsche 918 Spyder has top-mounted exhaust pipes in similar fashion to the flare launchers on the original 1966 Batmobile. How bitchin' is that? Not nearly as fascinating as what lies beneath the coupe's carbon fiber skin. 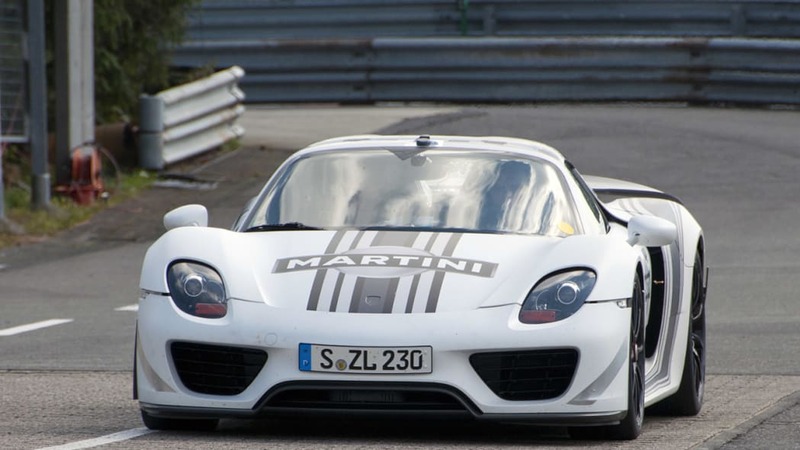 The all-new supercar, arriving late next year, is the most complex vehicle Porsche has ever designed. The hybrid gasoline-electric exotic features a race-bred 4.6-liter V8 supplemented by two electric motors drawing power from a liquid-cooled lithium-ion battery pack. It boots up like a computer, glides combustion-free like something out of a science-fiction movie and then ignites its fuel-fed engine to blast in excess of 200 mph. 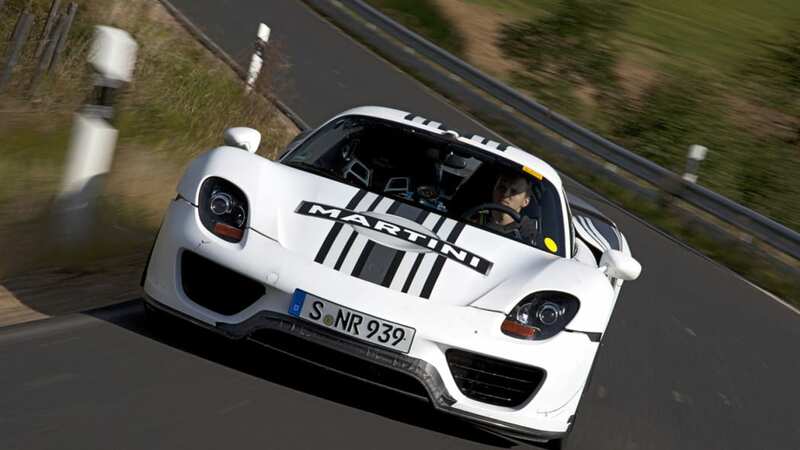 The 918 Spyder's existence is as significant as the Le Mans Porsche 917 and as technologically groundbreaking as the 1986 Porsche 959 – it suggests that hybrid supercars will not only prevail, they will dominate. 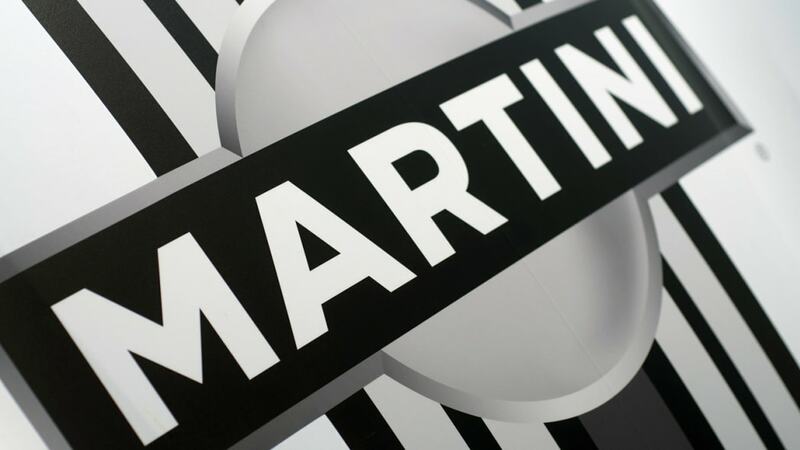 Porsche pulled the silk sheets off a fresh mid-engine concept at the 2010 Geneva Motor Show. The all-new 918 Spyder promised unheard of hybrid performance and drop-dead gorgeous looks (it made more than a few grown men cry). A little more than two years later, we are sitting in the cockpit of a working prototype test car in the hot pits at the Nürburgring. Miracles do come true. 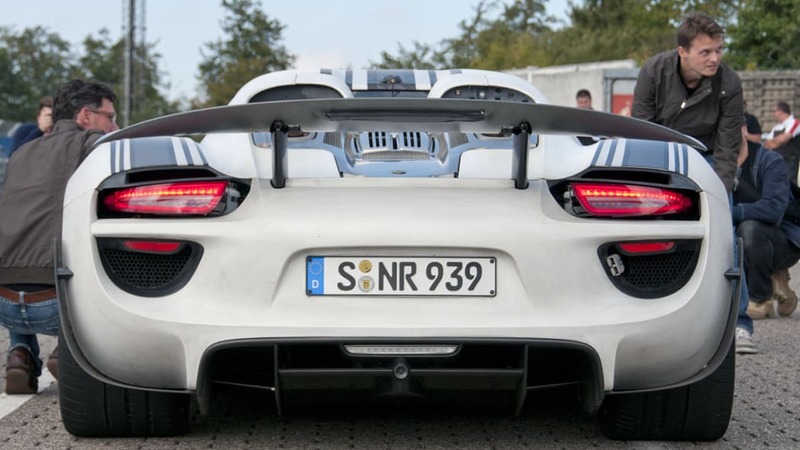 It is the most technically advanced vehicle Porsche has ever screwed, welded, molded and bonded together. 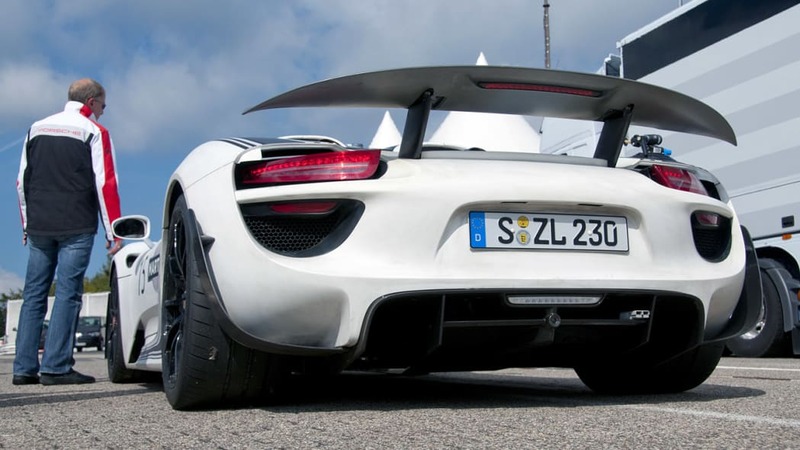 Gone are the clear polycarbonate wheel covers (molten brake dust permanently scarred the material) and the side exhaust pipes (worldwide certification proved too difficult), but the styling of Porsche's newest supercar remains mostly intact from what we observed in Switzerland. New additions include the aforementioned top-mounted exhaust (better packaging meant more effective thermal management), vents on the front quarter panels (dumping high pressure air out of the wheel wells) and magnesium wheels. Despite its work-in-progress state, our salivary glands went into overdrive when the grayscale Martini prototype (it goes full color when it's done) pulled up. As mentioned, the 918 Spyder is the most technically advanced vehicle Porsche has ever screwed, welded, molded and bonded together. To prevent brain overload, it is best digested in components. 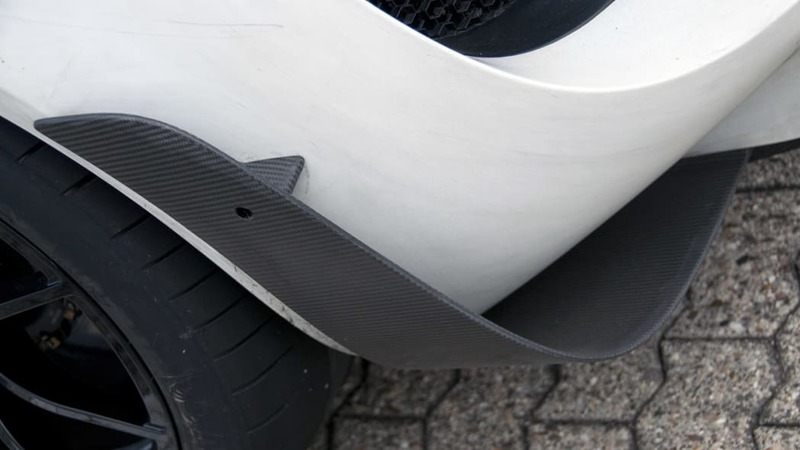 The chassis is constructed as a carbon fiber reinforced plastic (CFRP) monocoque tub interlocked with a CFRP unit carrier (the front and rear clips on the prototypes are aluminum, optimized for energy absorption in a crash, but that may change for production). 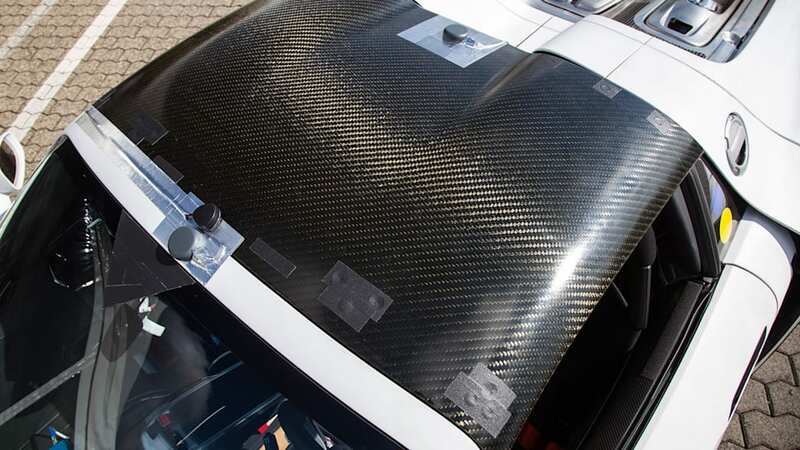 There is integrated rollover protection and the removable carbon fiber Targa roof panels split into two pieces for storage in the sizable front trunk when not needed. As of now, curb weight is about 3,750 pounds with 43 percent of the mass on the front axle and 57 percent on the rear. The very low center of gravity, a requirement for optimal handling, is about even with the wheel's center hubs. Curb weight is about 3,750 pounds with 43 percent of the mass on the front axle and 57 percent on the rear. The suspension is a double-wishbone design up front, with a multi-link configuration in the rear. An electro-pneumatic lift system (for raising the vehicle when approaching inclines) will be optional. 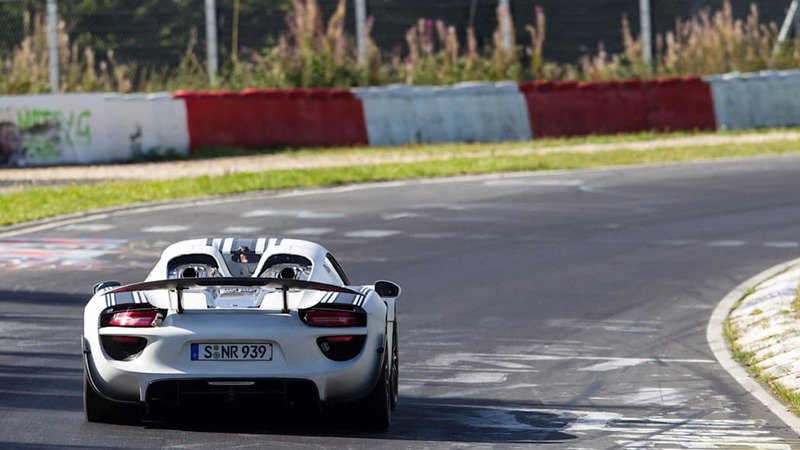 Porsche Active Suspension Management (PASM), the automaker's adaptive suspension acting on the twin-tube gas-pressure dampers both front and rear, is standard. The brake, wheel and tire package was designed to be lightweight, yet deliver impressive grip and stopping power. 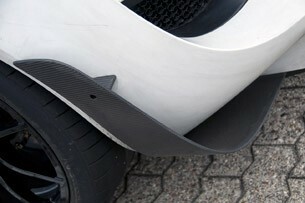 Porsche Ceramic Composite Brakes (PCCB), vented and perforated, are standard fitment on each corner. 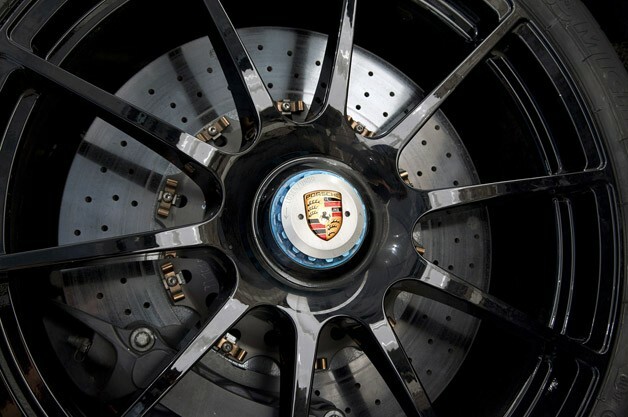 The massive ceramic rotors, stolen from the Cayenne Turbo parts bin, are 16.1 inches in diameter (1.4 inches thick) up front, and 15.4 inches in diameter (1.3 inches thick) in the rear. 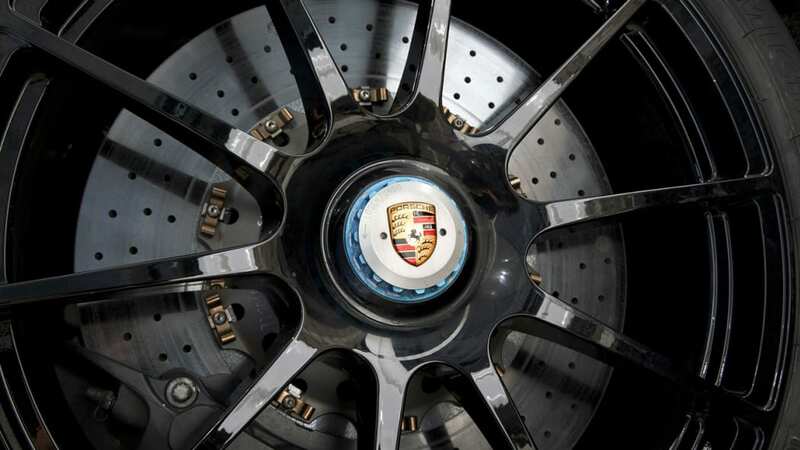 They are clamped by custom-made six- and four-piston aluminum monobloc calipers, respectively. The standard wheels are single-lug forged aluminum, in staggered sizes front and rear. Up front are 9.5x20-inch wheels wearing 265/35ZR20 tires while the rears are 12.5x21-inch wrapped in 325/30ZR21 rubber. Tires are formed with a custom compound and molded with asymmetrical tread, made by Michelin in France. 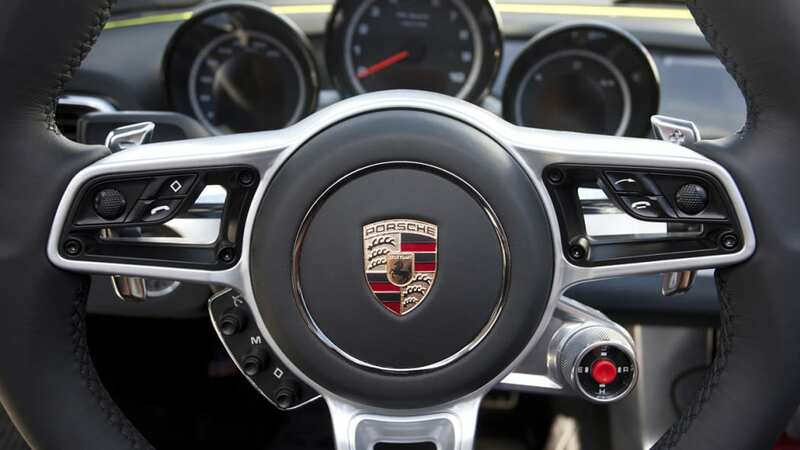 The front wheel steering is electrically assisted, as it is on the automaker's latest 911. 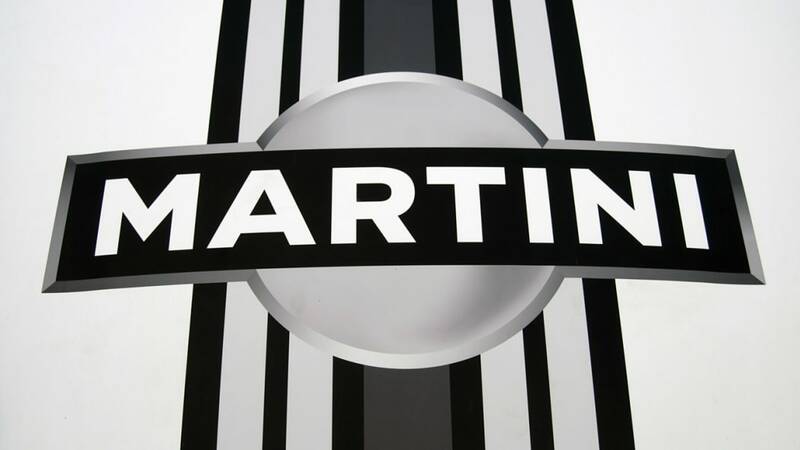 Interestingly enough, the rear wheels also have an electro-mechanical adjustment system allowing rear-axle steering of a few degrees in each direction (at low speeds, the rear wheels steer in the opposite direction for tighter cornering, while at high speeds they move in the same direction to enhance stability). There is no mechanical linkage between the front and rear axles and each has its own unique power source. 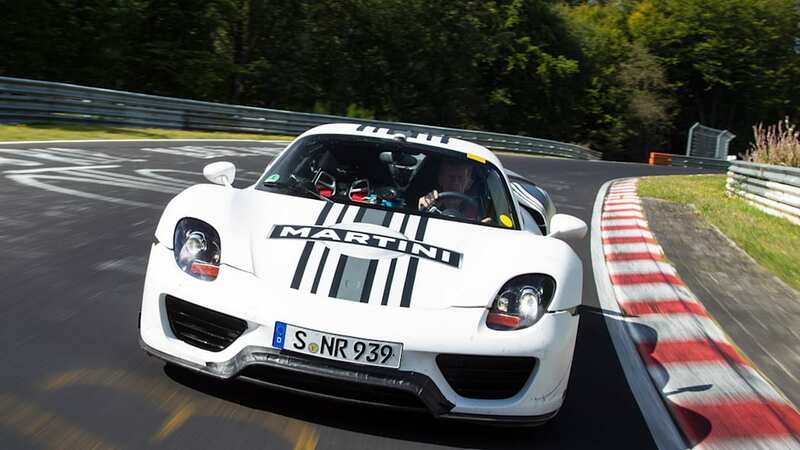 The powertrain is the heart and soul of any supercar and the 918 Spyder makes no exception. 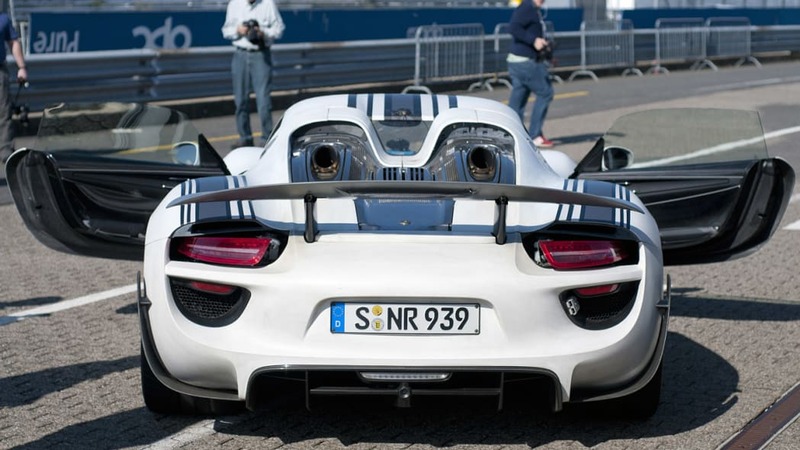 The 918's combustion engine cannot be viewed without removing body panels, but it would be familiar to those in racing circles, as it is a close derivative of the powerplant found in the race-winning RS Spyder. The 4.6-liter dry-sump V8, mid-mounted in the chassis, generates 580 horsepower at 8,500 rpm and 370 pound-feet of torque at 6,500 rpm. Redline is 9,000 rpm. Mounted to the V8, actually bolted together to form a single drive unit, is a 95 kW (127 horsepower) electric motor. The centrally located engine and motor send their power through a seven-speed PDK dual clutch gearbox, rotated 180 degrees on its longitudinal axis (lowering its mass closer to the pavement), driving only the rear wheels. 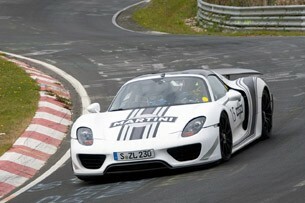 But there is more to the powertrain, as the 918 Spyder is actually all-wheel drive. Mounted on the front axle is an 85-kW (114 horsepower) electric motor, sending power to both front wheels completely independent of the rear powertrain. Since there is no mechanical linkage between the front and rear axles and each has its own unique power source, synchronizing the front and rear wheels of this "through the road" system was critical. 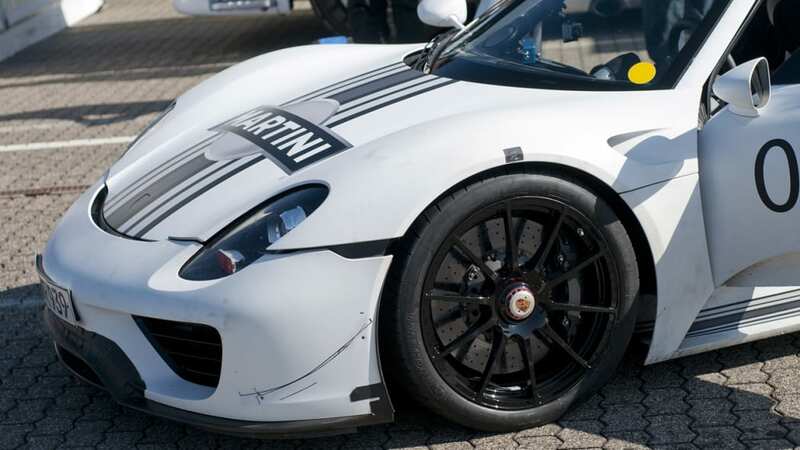 (Porsche engineers told us how the front wheels had the capability to overspeed and "stretch" the chassis during early testing). Of course, both electric motors and the gasoline engine are clutched to decouple for "sailing" (freewheeling sans power), to maximize fuel efficiency. The combustion engine drinks premium unleaded fuel from a welded aluminum tank situated just behind the passenger compartment, while power for the electric motors is stored in a liquid-cooled 6.8 kWh lithium-ion battery. It is also mid-mounted, below the fuel tank, to optimize weight and balance (the battery alone weighs about 660 pounds). The power pack is charged via regenerative braking from both of the driven axles, from the combustion engine or with an external plug connected to the passenger side of the vehicle, just aft of the cabin (the gasoline filler door is on the exact opposite side of the vehicle). 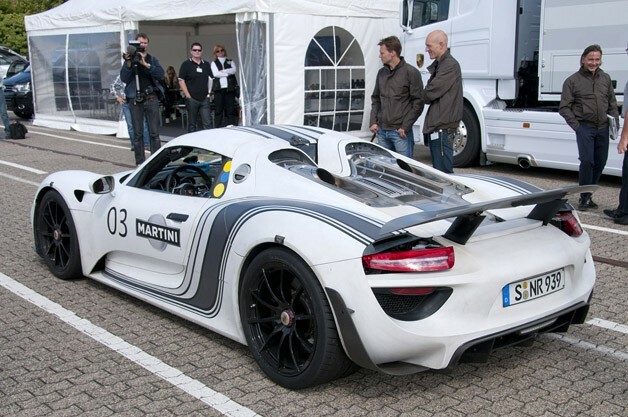 The wizardry buried beneath the 918's skin is more perplexing than the ingredients list on the side of a Froot Loops box. 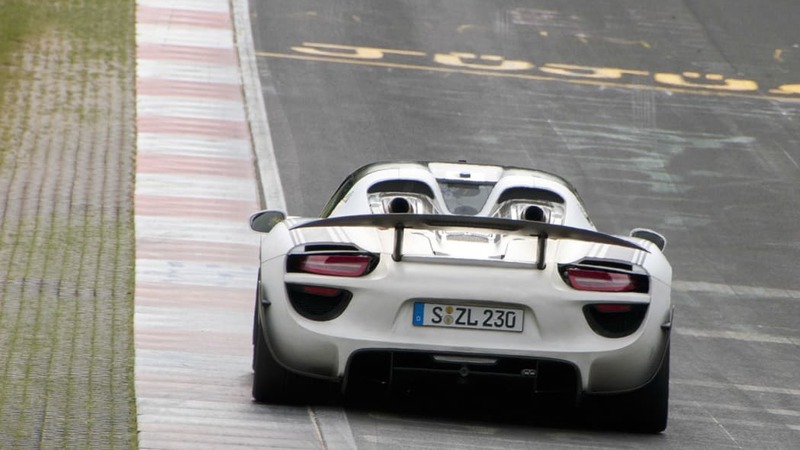 Aerodynamics contribute heavily to how the 918 Spyder drives and operates. A large active rear wing, retracted flush with the rear decklid when not called for, moves through several positions based on speed, driving style and driving mode (all of the concept models had fixed rear wings for development). At higher speeds, and to maximize efficiency, the wing is leveled for low drag. 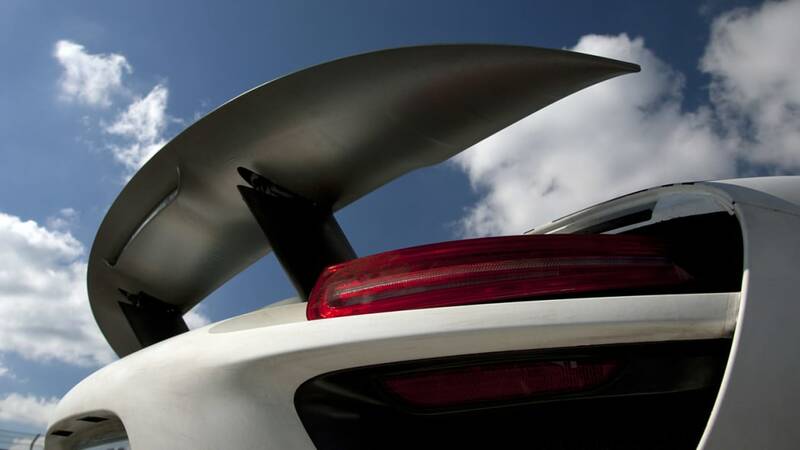 In sport modes, the wing tilts upwards to maximize downforce. 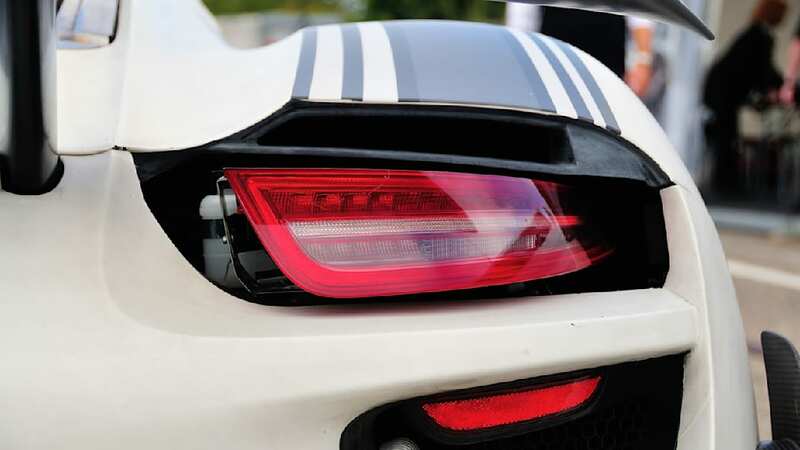 In addition, there are aerodynamic flaps beneath the 918's flush underbelly in front of the front axle that automatically open to channel air to the rear diffuser, creating ground effect downforce. 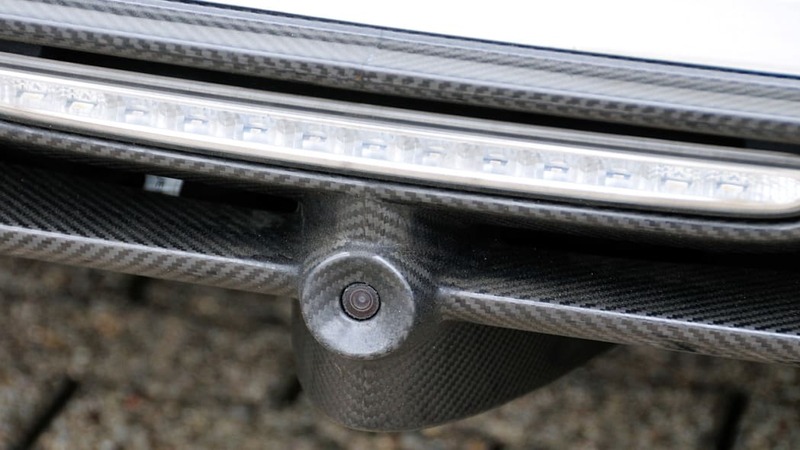 Lastly, the four horizontal slats just below each headlight bucket automatically open and close based on driving mode and the vehicle's thermal requirements (while airflow isn't needed at a standstill, the design team required that they open when parked purely for aesthetic reasons). 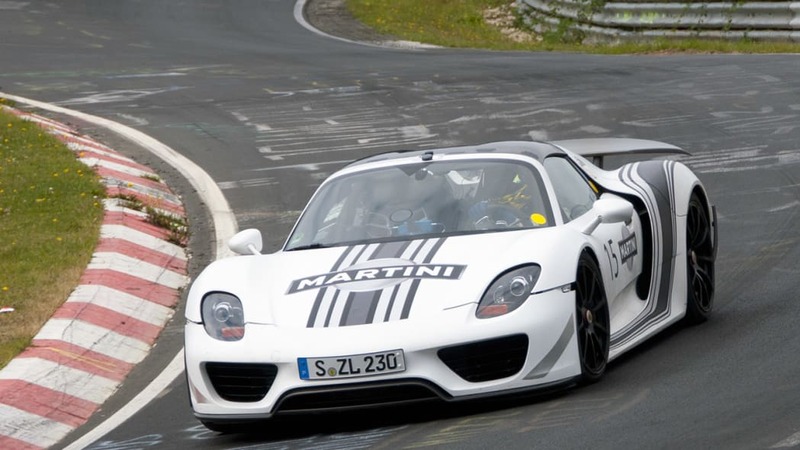 Computers, microprocessors and thermal management systems are as much of the 918 Spyder as are rubber tires. However, that stuff is quite technical (the wizardry buried beneath the 918's skin is more perplexing than the ingredients list on the side of a Froot Loops box). In a nutshell, there are four independent cooling circuits just for thermal management of the electric motors, transmission and battery. There are 55 different control units, dozens of electric motors and four primary black boxes all tasked with keeping the supercar humming. Of course, there are no external engine accessory belts, as everything runs off electricity. Thanks to an advanced digital interface, the driver is able to alter the hybrid's operating mode to one of five settings via a steering wheel-mounted "map switch" dial near the four o'clock position. The choices include: E-Power, Hybrid, Sport Hybrid, Race Hybrid and Hot Lap. The choices include: E-Power, Hybrid, Sport Hybrid, Race Hybrid and Hot Lap. 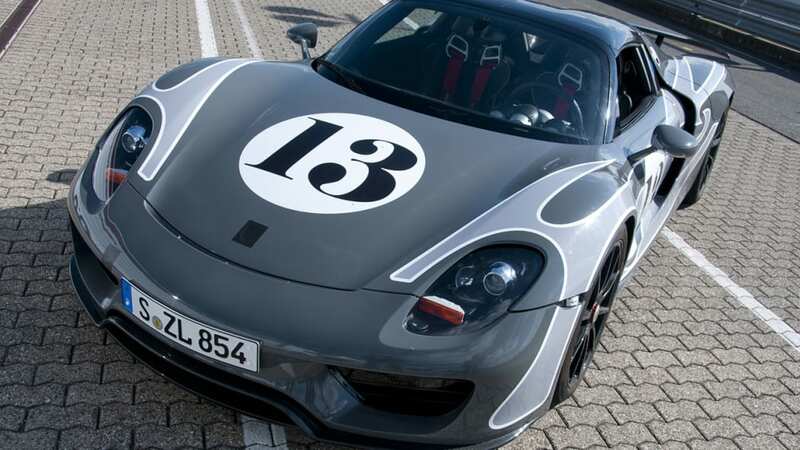 By default, and assuming the battery is sufficiently charged, the 918 always starts in "E-Power" mode. It is the quietest setting, as all propulsion is electric. In this configuration, the gasoline engine will remain off and the coupe will drive in pure EV mode for upwards of 15 miles at speeds up to 100 mph. If the driver requests higher speeds, or uses the accelerator pedal's kick-down feature, the combustion engine will immediately ignite. Furthermore, once the battery's charge state drops to a minimum, the eight-cylinder engine will automatically take over primary propulsion duties. "Hybrid" mode is engineered to maximize fuel economy and range. In this setting, the combustion engine cycles on and off as it works with the electric motors to propel the 918 efficiently down the road. "Sport Hybrid" mode is one click more aggressive, as the combustion engine runs at all times to provide primary propulsion. The twin electric motors are called upon to deliver moderate amounts of boost power for more spirited driving, and energy recuperation is done regeneratively. The battery charge state in this mode is maintained at a constant level. The most aggressive street mode is "Race Hybrid," where fuel economy takes low priority. The combustion engine runs at all times, both to provide propulsion to the rear wheels and to charge the battery when not under load. The electric motors are also both tuned to provide boost support at their full rated power. In this configuration, the battery's charge state fluctuates as energy is constantly being consumed by the motors and replaced by the engine. Lastly, the hell-bent "Hot Lap" mode is activated by pushing the red button on the dial only while in "Race Hybrid" mode. In this full power setting, the combustion engine runs constantly and the electric motors operate at their maximum limit. As this setting is designed only to deliver a few fast laps, all of the available energy in the storage battery is depleted – the Spyder is running at ten-tenths. 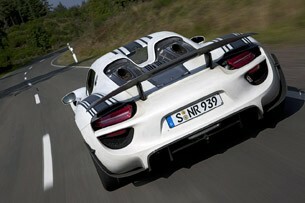 Add up the output and the 918 Spyder's total system power is 795 horsepower and 575 pound-feet of torque. Most important to many of you, and the topic that we have been putting off, is power and performance. 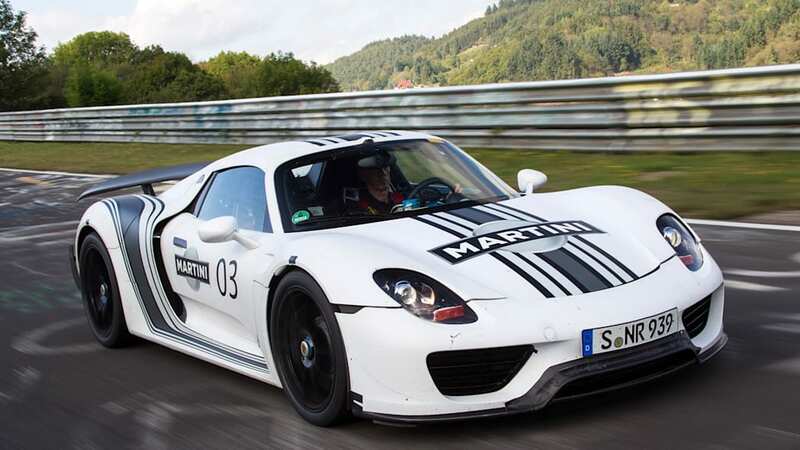 Add up the output from the one combustion engine and the two electric motors and the 918 Spyder's total system power is 795 horsepower and 575 pound-feet of torque. 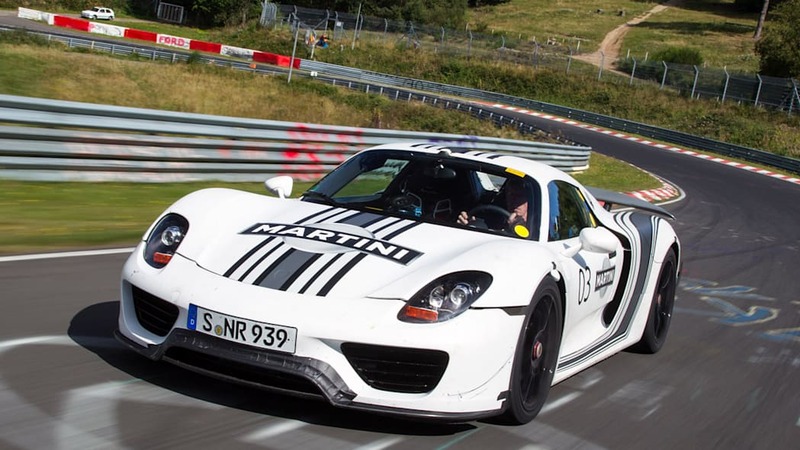 According to Porsche, the 918 will rocket to 60 mph in fewer than three seconds and reach a top speed in excess of 200 mph in its most aggressive setting. 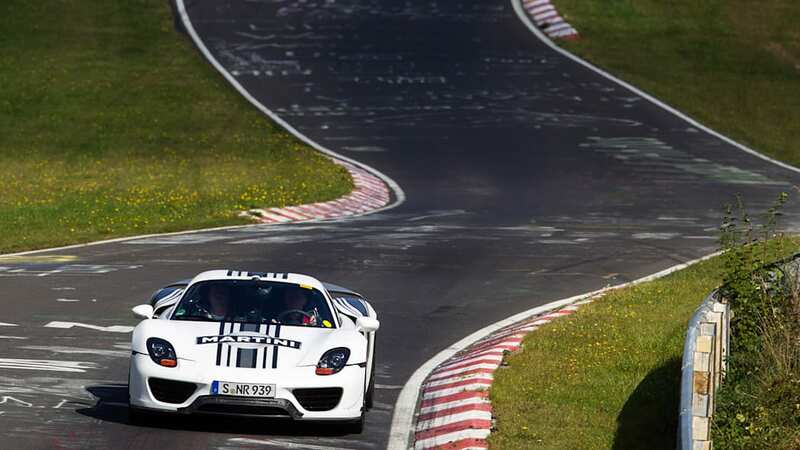 On the famed north loop (Nordschleife) at the Nürburgring, one of Porsche's 918 Spyder concepts ran a 7:14 less than two weeks ago (for comparison, Porsche's limited production Carrera GT, introduced in 2004, circled the same loop with a best time of 7:32). 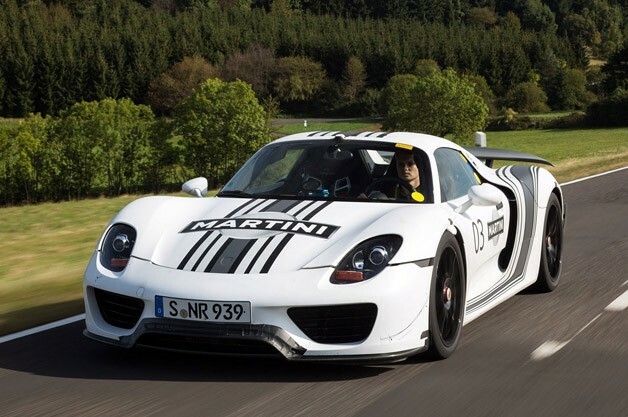 When it hits showrooms, the 918 Spyder will be one of the fastest street-legal vehicles in the world. 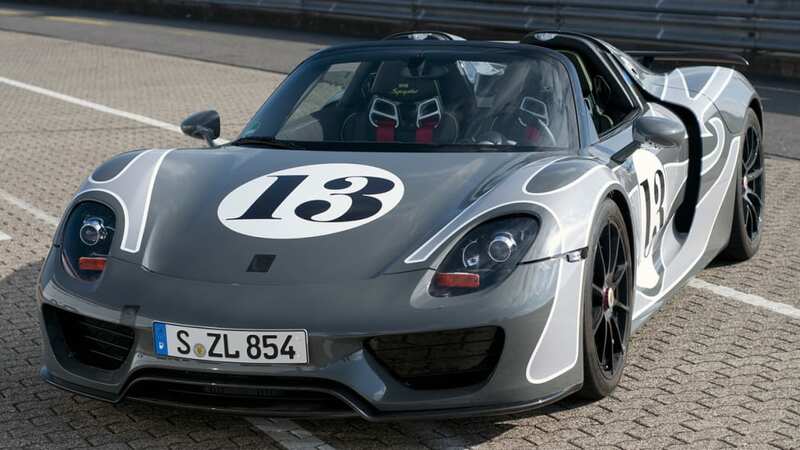 The performance numbers are impressive, but keep in mind the 918 Spyder is a hybrid – Porsche says it is capable of a scarcely believable 78 mpg on the highway. Before jumping in, Porsche made it very clear that the early cars (more than two dozen prototypes have been built since June of this year, including a few testing in Death Valley as you read this) are only about 80-percent complete on the exterior, and 70-percent finished mechanically. 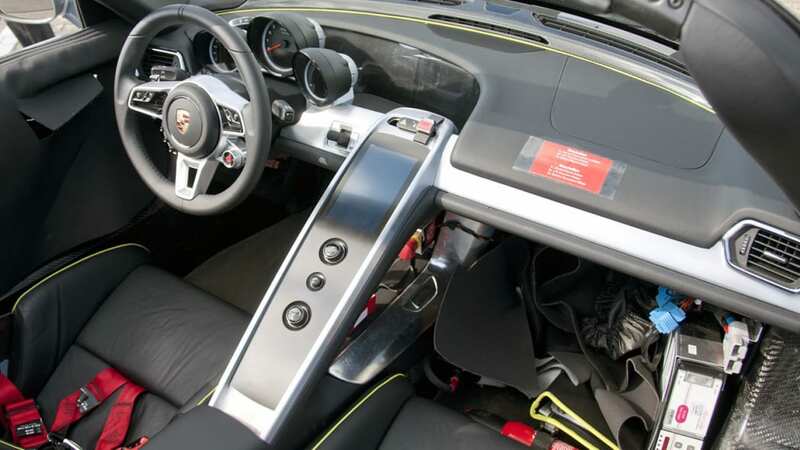 Our task was to overlook the misaligned panels, zip-tied 911 taillamps, parts-bin exterior mirrors and temporary headlamps and absorb the driving experience while strapped snugly into a six-point harness in the right seat. We smiled and nodded affirmatively, and then our feet left the earth as we jumped in head first. Despite a slew of intelligence gathering hardware, wires and boxes, the cockpit was quite comfortable. 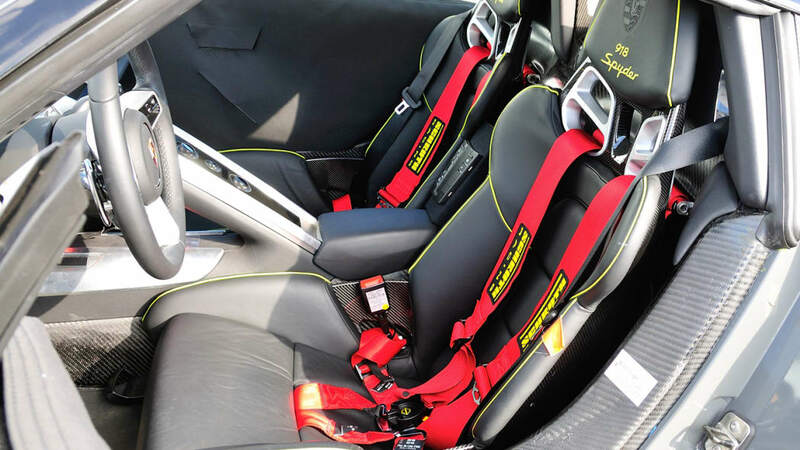 The carbon-fiber sport bucket Spyder seats are thinly disguised race equipment, lightly padded, but actually quite cozy. 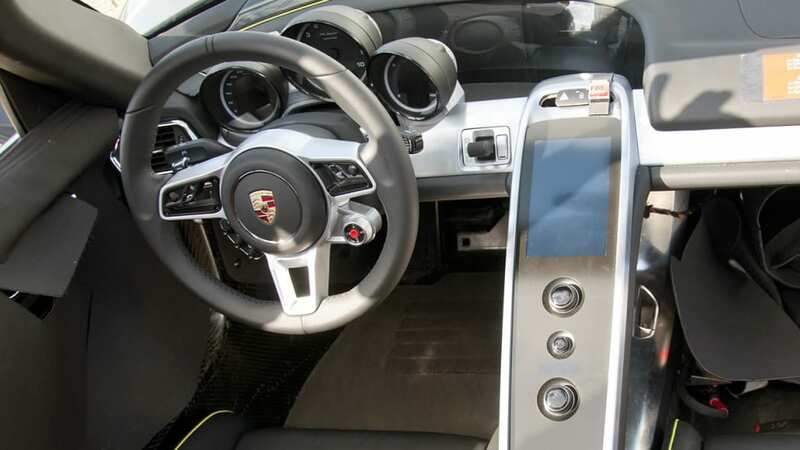 The cabin is dramatically divided by a flying buttress center console reminiscent of the Carrera GT's waterfall stack. A glass display housing the navigation, infotainment and HVAC functions reside there – the map's display is oriented portrait, rather than landscape, but we suppose that makes more sense when traveling at triple-digit speeds. 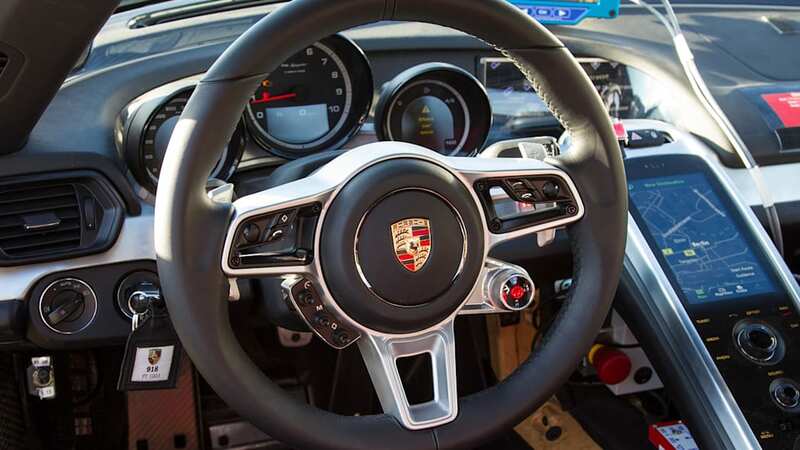 The driver faces a three-spoke steering wheel, modified with additional switchgear, and there are traditional analog gauges (tachometer, speedometer and fuel/energy balance) set behind it on the primary instrument cluster. 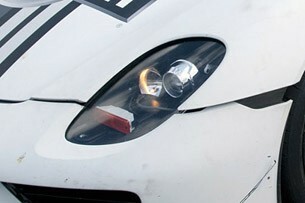 A key slot is on the left, as is Porsche's convention. Our factory driver turned the key and nothing exciting happened – it was almost a letdown. 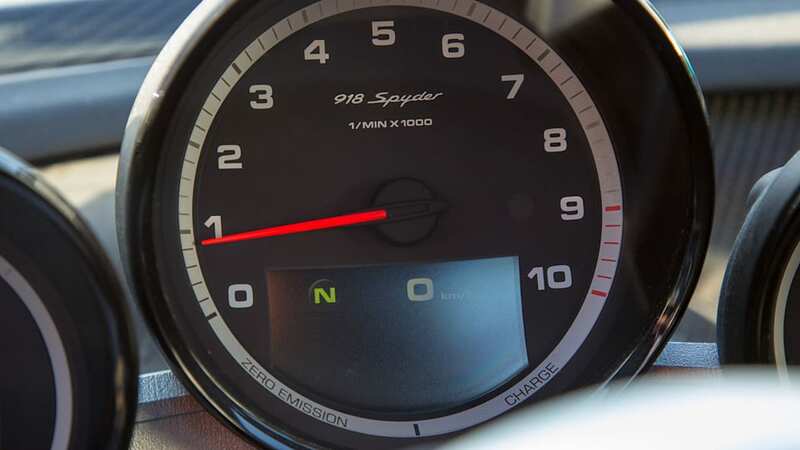 As mentioned, the 918 Spyder starts in "E-Power" mode (full EV) meaning the combustion engine is just along for the ride. With the exception of a few whirling electric fans and the sound of gravel bouncing off the insides of the wheel wells, we moved silently out of the Nürburgring pits and rolled past the automotive paparazzi hanging by the tall security gates (most were gleefully snapping our picture furiously). We circled the roundabout at a good clip, albeit quietly, and then pointed the nose out of town. The sound and sensation reminded us of Luke Skywalker from Star Wars crossing the desert in his anti-gravity Landspeeder. 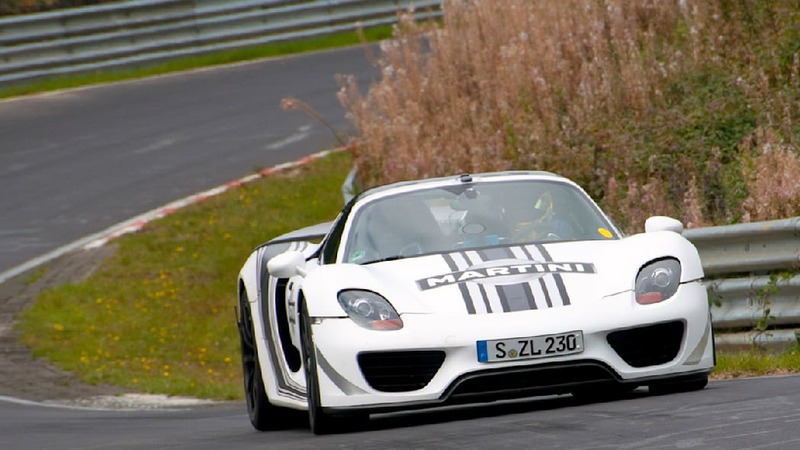 The 918 Spyder floated at a good pace, say about 60 mph, down the secondary roads. There were a few would-be cameramen trailing our rare bird in private vehicles, so our driver pressed the accelerator. Two powerful electric motors, providing about 240 horsepower, pushed us ahead with about the same thrust as a stock Boxster. It wasn't neck-snapping. At our higher cruise speed, the electric motors pleasantly hummed as we glided across the smooth asphalt – the sound and sensation reminded us of Luke Skywalker from Star Wars crossing the desert in his anti-gravity Landspeeder. It was eerily cool. About a minute went by with our host throttling up and down to demonstrate EV tractability before he inadvertently triggered the E-Power overspeed (meaning we had exceeded 100 mph). With an audible roar and a firm kick in the back, the 580-horsepower V8 joined the party. But Arnold wasn't ready to show us the Spyder's cards just yet. We slowed back into EV mode and silently slipped through the city center, catching fleeting glances as we passed pedestrians on the sidewalks. The suspension was unexpectedly supple with PASM nonchalantly absorbing all of the impacts (we have noted that heavy battery packs often actually improve the ride on most EVs). 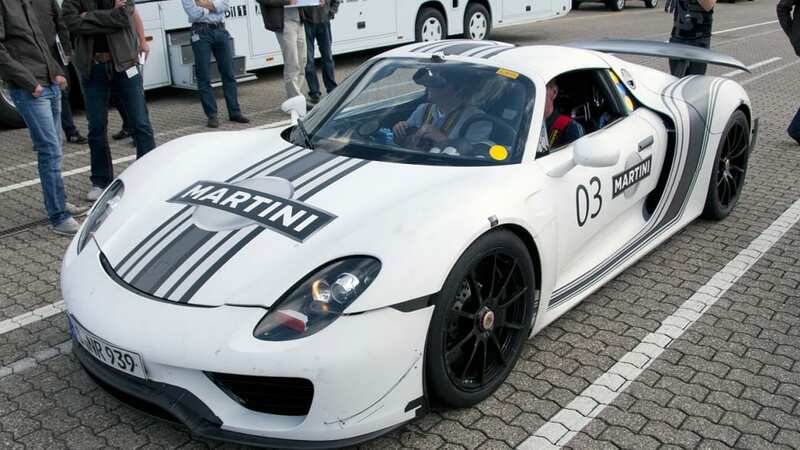 The Porsche 918 Spyder, up to this point a flower-toting pacifist, exploded with fiery energy. At the far edge of town, clear of all traffic and with only a few cattle dotting the countryside, Arnold switched over to "Race Hybrid" and floored the accelerator. 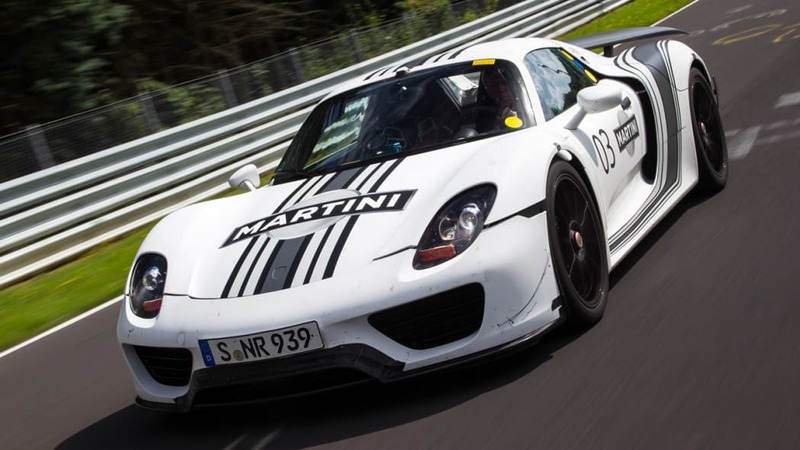 The Porsche 918 Spyder, up to this point a flower-toting pacifist, exploded with fiery energy. Slammed into our seat, we choked on our tongue as expletives spilled out of our mouth. 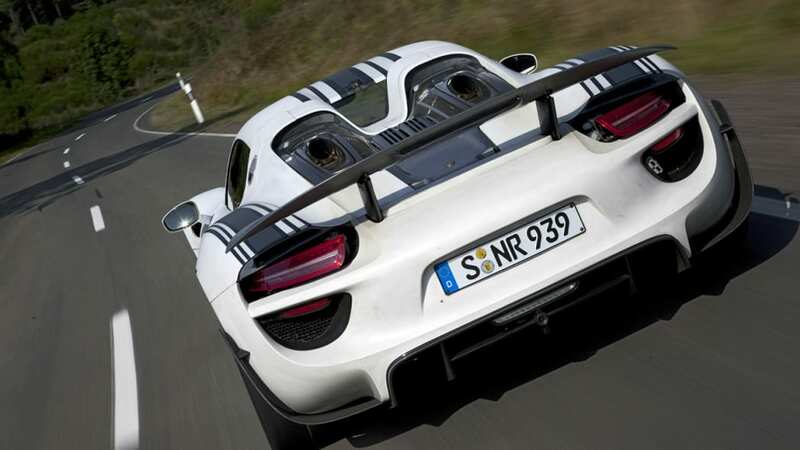 In this take-no-prisoners mode, the 918 was anything but tree-hugging frugal. All four wheels ripped at the pavement with microprocessor-calculated precision as two electric motors and a combustion engine worked together to launch the Spyder down the road. 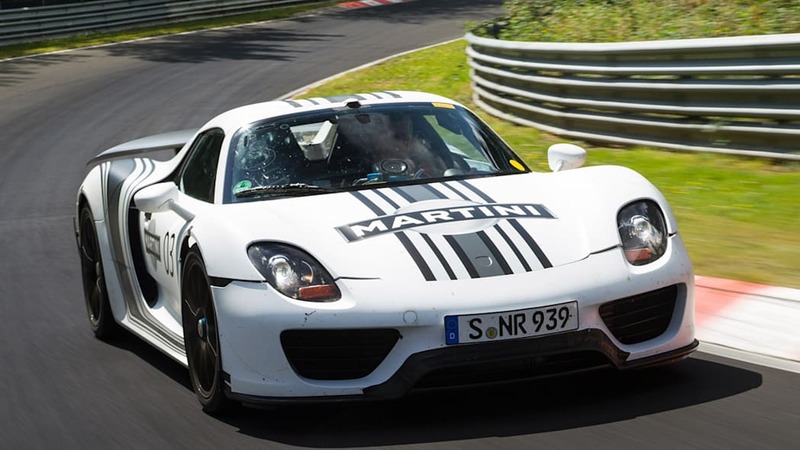 We've been in bloody fast cars, likely faster than this one, but on these twisty German country roads, the 918 Spyder felt as agile as an antelope and quick as a cheetah. From the passenger's seat, we watched the driver for clues. The acceleration was blisteringly quick, even at speed, thanks to the electric motors at each axle, but the Arnold's hands were smooth and deliberate – not fighting torque steer or an unbalanced power delivery. We watched the steering wheel move to the right, felt firm g-forces push us into the left bolster, and then lost our breath as the vehicle's stability control (it was left in Sport Plus mode) made calculations faster than any Formula One driver's brain. The tires were instructed to yank us out of the corner at warp speed. 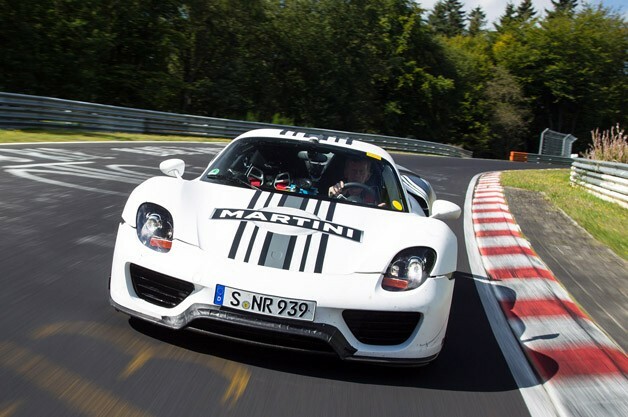 The 918 recovers about three times as much energy as a Toyota Prius during deceleration. 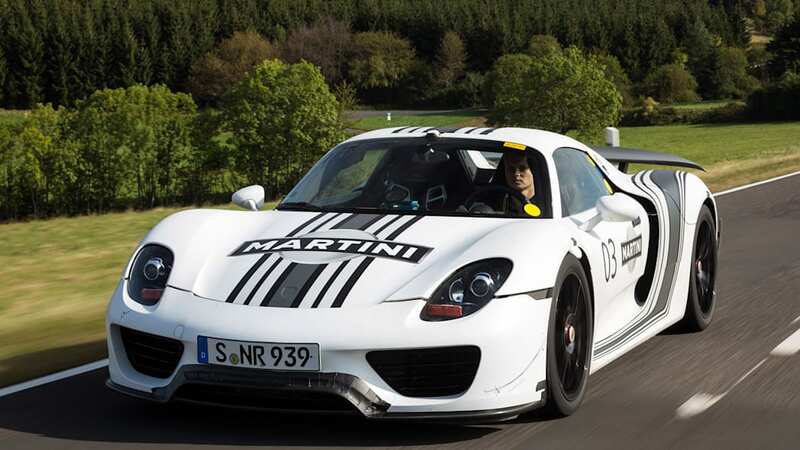 The oversized ceramic brakes are assisted by aggressive regenerative braking on both axles (this industry first allows the 918 to recover about three times as much energy as a Toyota Prius during deceleration). The Spyder indeed stops as quickly as it goes. Running out of open real estate, our driver switched over to "Hybrid" and the pace slowed considerably as we came upon traffic. 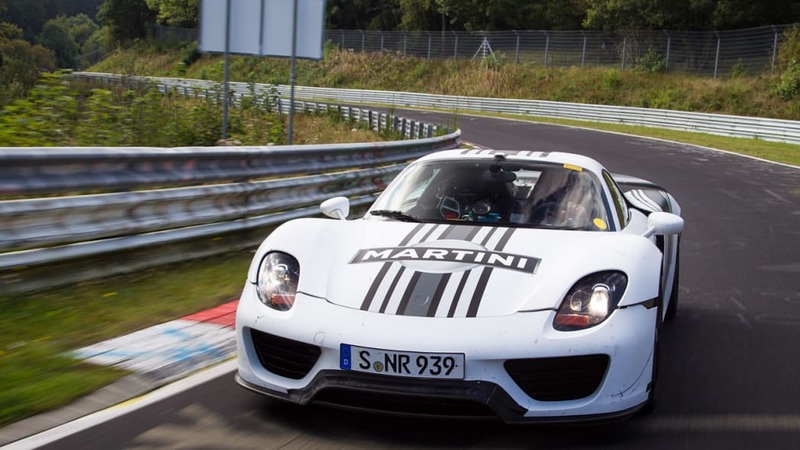 The combustion engine would shut down at lights, but hard acceleration instantly woke it back up (the 918 Spyder is still very quick in this configuration while still running efficiently). 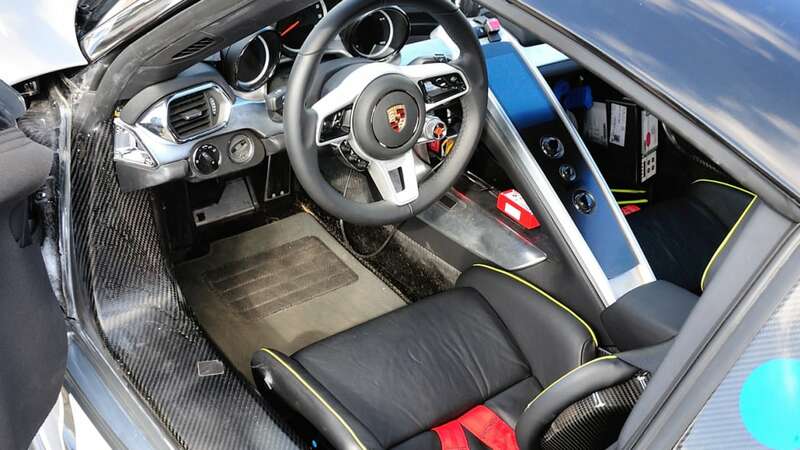 As it's the default setting once the batteries are discharged in "E-Power" mode, one has to assume that most drivers will keep their 918s in Hybrid mode all of the time and be perfectly happy. Back in the pits, we sat down in a chair to consume and absorb the data gathered during our ride. 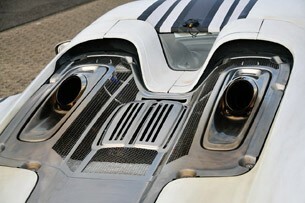 We were most impressed by the 918's propulsion system and its seamless cooperation of three independent power sources. It wasn't jerky, and it never seemed to be caught off guard. It felt polished. We were also galvanized – make that caught totally off guard – by its suspension tuning. The ride was unbelievably comfortable over broken pavement yet astonishingly adept in the corners. 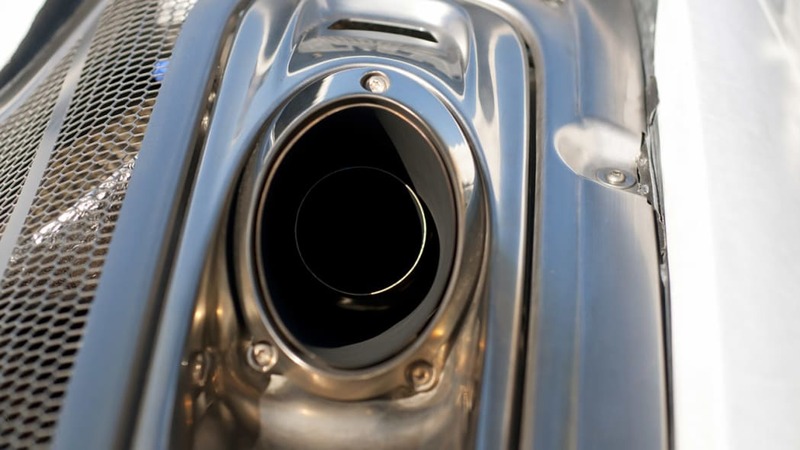 Less impressive was the combustion engine's exhaust note, which sounded tinny with an unpleasant hint of rattle. 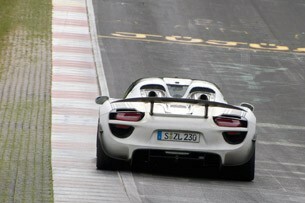 No worries, says Porsche, as the pipes will be tuned like a musical instrument for the finished product. All of the other bungled items, like panel gaps and missing components, naturally remain irrelevant to our discussion until production. 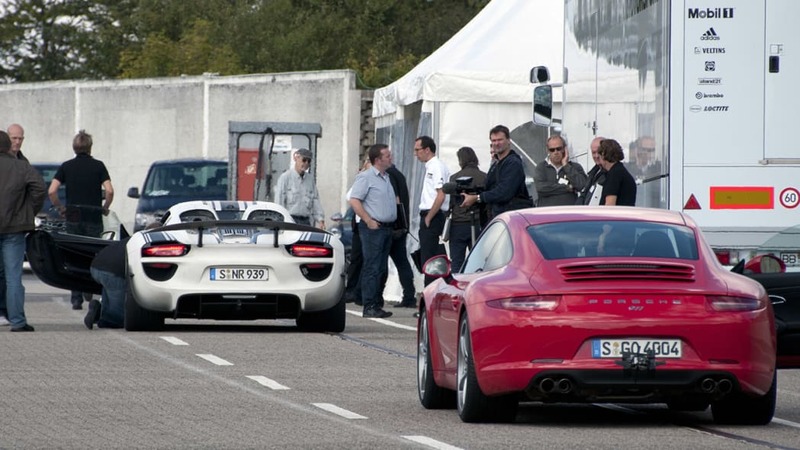 Porsche intends to start assembly on September 18, 2013 (did you catch the significance of the date?). 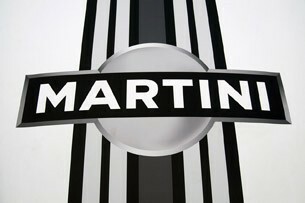 Speaking of production, Porsche intends to start assembly on September 18, 2013 (did you catch the significance of the date?) and deliveries should follow in December. 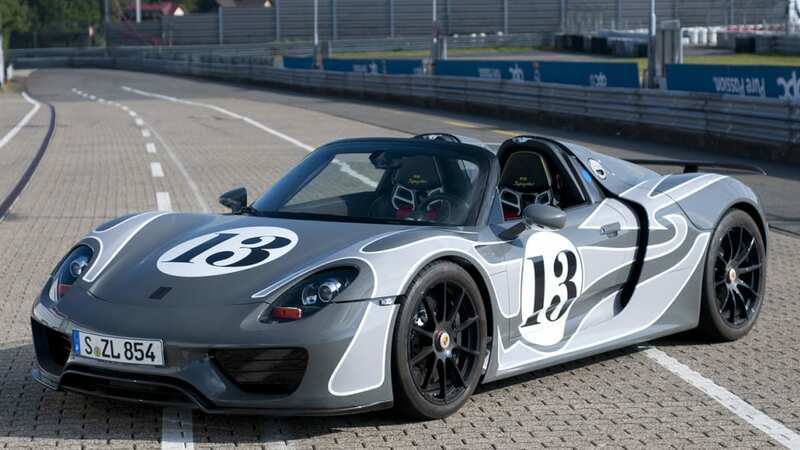 All told, the automaker will manufacture 918 units, all of them 2014 models, with a base price of $845,000. 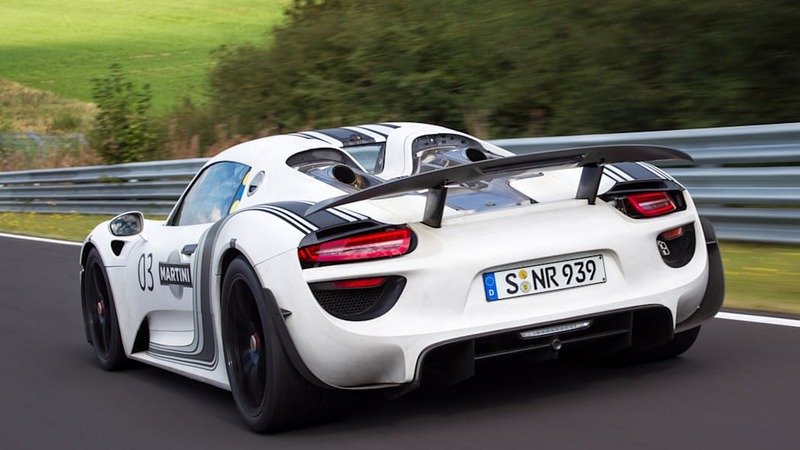 One significant option, not discussed above, is the Weissach package. 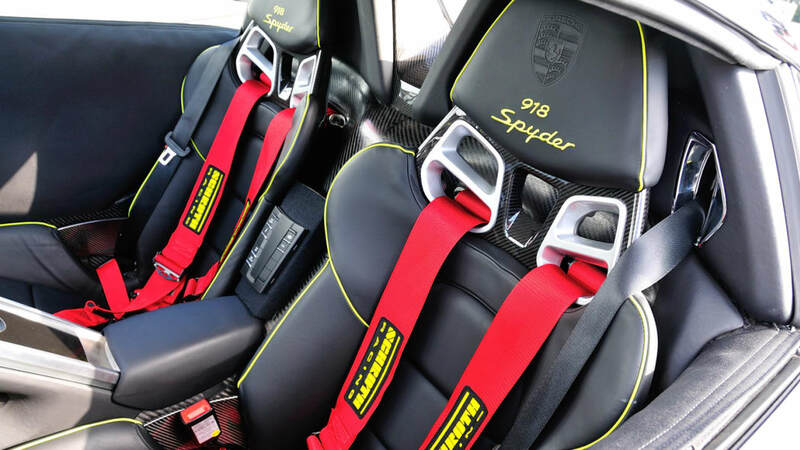 Fitted to all of the prototypes in attendance, the high-performance upgrade includes additional lightweight carbon-fiber appointments, lightweight magnesium wheels, flame-resistant upholstery, racing belts and additional aerodynamic aids. We don't know pricing yet, but we do know it cuts nearly 80 pounds off the curb weight and improves performance. It will be a must-have for wealthy track junkies. 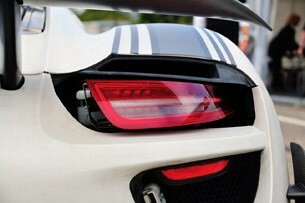 Our very early ride in the 918 was inarguably a tease. 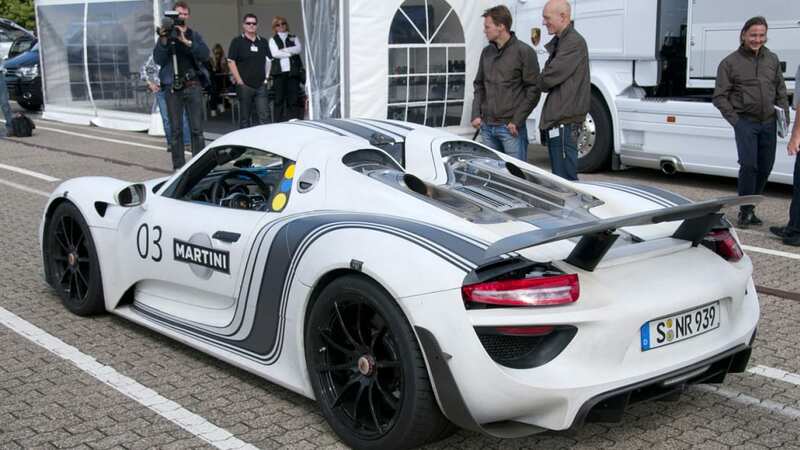 It was also a very bold move on Porsche's part to show off its advanced-powertrain supercar before it was fully cooked (few automakers, European no less, allow nitpicky journalists like us behind-the-scenes a year before production). 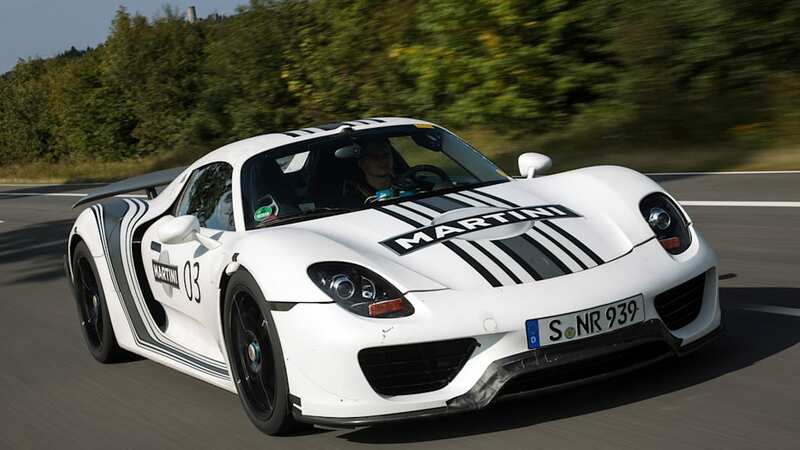 Yet more momentous than anything else, our journey in the 2014 Porsche 918 Spyder prototype was an opinion-altering physical taste of where supercars are heading in the next decade. Displacement is out – hybrid is in. This is the future, and we are emphatically on board.